The Obvious: Heading into the February signing period and spring football practice not all that far away, there’s still no word on what offense the Trojans will be running in 2019, and it speaks volumes of where we are at today. The Not So Obvious: The O/NSO fully understands that if Kliff Kingsbury hadn’t left for the NFL, the Trojans would be running the “Air Raid” offense. With “The King” now in the Phoenix, it’s anybody’s guess what offense the Trojans will be in 2019, and now we really don’t know what Clay Helton’s philosophy is and maybe at this point neither does Helton. He seems to – at this point – placed his “own” offensive playbook in his John McKay Center locker. We know what Gentleman Clay has preached in past years, but one can only ascertain that he has raised the white flag regarding his own offense and is willing – or Lynn Swann is demanding – to think outside the box. One of the biggest arguments during the Helton era: What is the identity of the offense? Now Trojan fans are also wondering: What is the Trojans’ offense? The Obvious: Trojan fans and the offensive players on the 2019 USC roster are waiting for the announcement of Clay Helton’s next offensive coordinator and quarterback coach, but the question is: What will last longer, the current national government shutdown or the naming of an offensive coordinator? The Not So Obvious: You’ve heard some of the OC candidates mentioned: Graham Harrell (North Texas offensive coordinator and QB coach/Some insiders believe he is the lead candidate), Major Applewhite (former Houston head coach), and Jedd Fisch (Rams offensive assistant). Harrell is a Kliff Kingsbury disciple, and there is the unconfirmed rumor that Kingsbury recommended Harrell as his USC replacement. There are also whispers that Harrell may have interviewed with Clay Helton late this week. We shall see. 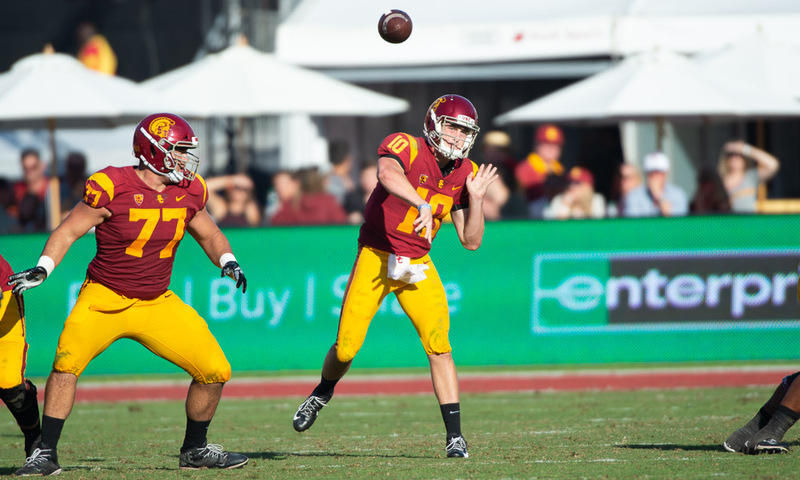 The Obvious: The 2019 Trojans return their three major quarterbacks in starter JT Daniels along with backups Jack Sears (photo above – No. 10), and Matt Fink. The Not So Obvious: Will the new offensive coordinator have first say on who will be the starting quarterback? Will the new guy open competition in the spring as Kliff Kingsbury said he was going to do? It would appear that if the Trojans hire an assistant coach rather than a former head coach, Helton might have more influence on the starting quarterback and play-calling. The devil will be in the details. The Obvious: Tee Martin is the former offensive coordinator and play-caller for the USC Trojans. The Not So Obvious: Whatever you may have thought of Tee Martin as an OC and play-caller for the Trojans, he wasn’t the lone reason the offense was a major issue. Clay Helton, who assumed the duties of play-calling late last season, proved that “lone reason” theory with his underwhelming late season results with points on the scoreboard – especially in the second half of games. For Martin, however, there appears to be a happy. Tee is returning to the University of Tennessee – where the standout recruiter was the starting quarterback on the 1998 Vols’ national champions. Martin will be an offensive assistant coach, but his role has yet to be be defined. The Obvious: Trojans 2019 tailback commit Jordan Wilmore (Lawndale, Calif./Lawndale) officially decommitted to the cardinal and gold this week and will now pursue other recruiting options. The Not So Obvious: The turmoil and the uncertainty of the Trojans’ offense may have played a contributing role in Wilmore looking at other universities. Wilmore, who was a true old school type of running back, sent messages before the early December signing period that things with the Trojans weren’t right, and it was confirmed this week. A tailback that reminded many Trojan fans of former USC great Ricky Ervins, Wilmore is now said be selecting between Utah and UCLA, both Trojans’ Pac-12 South Division rivals. The Obvious: Former Trojans’ head coach Steve Sarkisian is expected to be named the new offensive coordinator at the University of Alabama. The Not So Obvious: We should all be as fortunate as Sark, who keeps getting hired and receiving the type of money that most of us could only dream about. His latest firing was as OC of the Atlanta Falcons, but his employment opportunities weren’t lacking as new Arizona Cardinals coach Kliff Kingsbury approached Sark about the OC position only to be trumped by Nick Saban for The Tide’s offensive coordinator position. You can draw your own conclusion regarding Kingsbury’s OC invitation for Sarkisian and Saban’s desire for Sark’s return to Tuscaloosa. The Obvious: With the Los Angeles Rams on the road on Sunday for the NFC title game in New Orleans and their home season completed, the Coliseum renovation is now full steam ahead. The Not So Obvious: The O/NSO recently watched a Coliseum history video that chronicled the past, present, and future. The future segment was especially interesting. There was a big push in the video to present nice the new Coli structure would be. However, it’s hard for general fans to get overly excited unless you’re among the financial elite who be able to enjoy what is sure to be a very opulent and impressive Scholarship Tower and suites. The Obvious: Former Trojans linebacker Levi Jones, who was dismissed from the program last season after some apparent off-field incidents, has transferred to North Carolina State. The Not So Obvious: There are a number of USC players who have left the program in recent times, and you always wonder if this could have been avoided with better monitoring or maybe just “fear” of their position coach’s responses. And consider the head coach, too. Then again, maybe it’s just the character of the player. It would be easy to make an overall judgement, but each case has to be evaluated on its own merits. Maybe it all gets back to recruiting and knowing who you are recruiting. Character counts. The Obvious: And finally, there are more and more players transferring schools due to player dissatisfaction and playing time along with new NCAA transfer rules. The Not So Obvious: Former Alabama quarterback Jalen Hurts has announced he will play next season at the University of Oklahoma. So when is the last time the Trojans got a legitimate four-year transfer quarterback?